10/12/2012: Added a little bit on stopping at a post office and talking to someone at Motomachi that I had forgotten to include. Today was our last morning on the main island of Honshu for a while as we were heading under the ocean to Hokkaido! (北海道 = North + Sea + Road). Our first stop was the city of Hakodate (函館 = Box + Building) located just on the other side of the ocean separating the two islands. As the crow flies it's only about 100km from Aomori but the train takes a more scenic route in order to cross the ocean at the narrowest point. This connection between the islands is done via the Seikan Tunnel (青函トンネル = Blue + Box + Tunnel). The name (Seikan) comes from joining the first characters of (青森) Aomori and Hakodate (函館). The reason it's not pronounced Aohako is due to the fact that each kanji as a number of different possible readings (or pronunciations). The two main types are the "On Reading", derived from Chinese, and the "Kun Reading" which is derived from Japanese. "Ao" and "hako" are both Kun readings while "Sei" and "Kan" are On readings. The Seikan Tunnel is significant as it's currently the longest and deepest operating rail tunnel in the world. The tunnel reaches a depth of 240 meters below sea-level (140 meters below the seabed) and it's total length is 53.8km (with a 23.3km undersea portion). All up and through the tunnel it's a 160km journey from Aomori to Hakodate by train, and since there's no more shinkansen the trip takes just over two hours. The first train to Hakodate didn't leave until 8:24 for some reason so we had plenty of time to have our free breakfast today! We went down just after 7am (around 7:06am) and found there was a massive line! I guess everyone had been waiting until breakfast. I'm not really sure why they don't start earlier. The food was not as good as comfort but was still acceptable. I remember there were some cold meat balls I couldn't eat (onions) although Kate had some. I think I got a few sesame seed flavored rice balls. After breakfast we had a little bit of a look at the Aomori morning markets. They were located under a shopping center in a sort of basement level. The markets were alright although not fantastic. Lots of fish and crabs and seafood. There was some other produce as well and Kate bought a massive apple from one of the stalls there. After the markets we made our way to Aomori station and caught our train. There's two types of Limited Express trains to Hakodate, Hakucho (白鳥 = Hakuchou = White + Bird = Swan) and Super Hakucho. I don't think there's much difference but I wanted the super because it sounds better. We just had the regular plain old Hakucho though. One thing I did notice though was that the Super Hakucho we got from Shin-amori a few days ago had maps on the backs of the seats with Seikan tunnel crossing times marked in. The Hakucho did not have these and I was a bit miffed about it as I didn't want to miss our entrance into the tunnel. Anyway the train ride was fun and offered many nice views of the ocean. There were also lots of tunnels before the main one! I kept being ticked as I wasn't really sure if the one we were in at the time was the real deal! Some of the smaller ones were rather long too. I realised after about 8 minutes into the real one that it must be the Seikan tunnel. The tunnel itself was pretty uneventful. Just like any other tunnel I guess. At one point though I remember seeing an underground station flash by which was exciting. There's two underground stations within the Seikan Tunnel although only one is currently operational. Yoshioka-Kaitei Station on the north side serviced its final train in 2006 and was the deepest railway station in the world located 149.5 meters below sea level. A few trains a day still stop at Tappi-Kaitei Station which is located on the south side of the tunnel and is connected to the surface by an underground cable car. I'd really like to visit this station as it contains a museum and it's cool that it's so deep. I fear I will not get the chance though as it will be shut down around 2015 when the Shinkansen starts operating through the tunnel. Once this happens they will continue to maintain at least one of their original functions as emergency escape routes. After we exited the tunnel I'm pretty sure I saw the Hokkaido Shinkansen under construction. We arrived at Hakodate on time at around 10:30am. Just like in Aomori the next train was waiting but this time bound for Sapporo. That was not us though so we exited the station and after getting our bearings, crossed the tram tracks and made our way to our hotel. It was another comfort and since it was before check in time we just stored our luggage. We thought we'd head to Fort Goryokaku (in the north east) first and then return back past our hotel and continue onto the red brick warehouses, Motomachi and finally Mount Hakodate (in the south west). To get to For Goryokaku we rode the tram from Hakodate station to the Goryokaku Koen Mae stop. When we got off we asked for a day pass from the driver. The pass came with a lot of information and little booklets, apparently they enable you to receive discounts and such at tourist attractions. It was about a 600 meter walk from the tram station to Fort Goryokaku and I remember seeing a fair amount of kids running around in Halloween costumes. It looked like Halloween is a much bigger deal in Japan than in Australia. About half way along we saw a massive line of the costumed kids outside a building, I don't know what the building was but it had Karaoke written along the top in Katakana. We got a drink from a vending machine along the way. It's great how prevalent they are. So convenient. Before having a look at the fort itself we went to Goryokaku Tower. This 107 meter tall tower was built in 2006 and offers views of the fort, Hakodate and the ocean and mountains in the distance. It wasn't very busy when we went in so we paid the 840 yen administration and went straight up. We showed our tram pass when we bought our ticket and received a complimentary post card each. We were also asked to point to where we were from, from a list of countries. Apart from Australia I remember seeing Korea and the UK. I thought it was a bit strange that there was no USA or China to pick from though. Maybe USA and China are so common they can recognise the names without a list? I'm not sure. Goryokaku Fort is a huge citadel built in the shape of a star. It was constructed around 150 years ago in order to defend Hakodate against western powers. It also later served a part in the civil war between the Meiji government and the Shogunate. Since 1910 however it has been a public park and due to over a thousand cherry blossom trees it is a very popular flower viewing (Hanami) location. The views of the fort from the tower were amazing. It was massive island of green and blue in the white cityscape and you could easily see the star shape. The tower had slanting windows so you could learn over and look straight down with ease. I love how the tower was built for the sole purpose of providing view of the fort and Hakodate. Looking down we also saw a church directly below that had some message in massive writing about Jesus on it's roof. I thought that it was a good advertising opportunity they took advantage of there! After descending the tower we had a bit of a look around in the souvenir shop at the bottom, the tower mascot was really cute! It was basically just the tower with arms and legs- his antenna was a particularly endearing charm point. I regret not buying one of the plush toys. They even had a little bio on his likes and dislikes. We left the tower and walked the short distance to the fort, looking back at the tower I found that I couldn't see the antenna! That was a bit disappointing. To get into the fort we had to cross a bridge over a moat. Just before the bridge and off the path a little bit there was a shop playing music which had a sign saying "貸しボート" (Boat rental). We wanted to give it a go but we were too scared to go in and ask as no one else was renting any of the boats. So we continued across the bridge and into the fort. The old magistrates office is located in the center and although we didn't go in we had a look at it from outside. We continued walking all the way to the back where we climbed up to the top of the rim of the earth wall surrounding the fort. We followed the path up there all the way back around to the front entrance (except in places where the road cut through). A number of places seemed pretty dangerous as it was a steep drop down to the water below. After the fort we walked back to the tram and caught it back to our hotel. 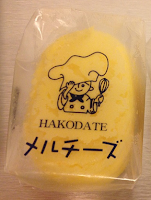 It was time to try some cheese cake that we were recommended. Apparently it's delicious and you could get it at the bottom of the Loisir Hotel. I don't actually like cheese cake but this is nothing like Australian cheese cake. We had a look around for a while until we managed to find it. It's shaped like a little oval and is in a fridge. There's a few different flavours you can get but I just tried the plain one. It's amazing! So so good! I absolutely loved it! It feels like it's really bad for you- it's so creamy! Super delicious and highly recommended! I ended up having another as it was so good! We also went to the post office as we needed some stamps to send Kate's postcards. Unfortunately we did not consider the day- It was a Saturday and the post office was shut! After that treat we hopped back on the tram, got off at Jujigai and made our way down to the red brick warehouses. These are some old buildings on the waterfront filled with "Trendy" shops. On impulse I got some strawberry cake that I'm always seeing people eat on TV. A lot of effort went into wrapping it up! The slice of cake was wrapped, a box made, a stand made and put in the box, the cake put in the box, a slab of ice wrapped and put in the box, the box closed and taped shut, box in bag, bag taped shut. Only for me to take it outside and tear it all apart. Everything in Japan is wrapped like this, although they manage do it in the same amount of time it takes someone in Australia to toss your purchase in a bag as well. Generally speaking. After all that it turns out it's just a strawberry cream cake which I don't actually really like. It was still alright though and it was nice sitting outside in the sunny day next to the water so I ate it up. I think Kate got an ice cream. A healthy lunch for both of us! One of the warehouses was completely devoted to the souvenir style food that's endemic to Japan. We got these delicious caramel lolly things. They reminded me of Milkos but were much more delicious. There's lots of different flavours but I found the plain milk one to be my favourite. Potato was probably the worst. I have no idea why Kate got potato. I thought she learnt her lesson after buying sweet potato momiji manjuu at Miyajima last year. Next stop was the Motomachi district which reached via a ridiculously steep hill. I tried gritting my teeth and running up it for a bit but I must've been slightly dehydrated as that gave me a headache. When we were about half way up a big tour group appeared at the top of the hill and watched us struggle up! Once we got to the top of the hill we turned right into a nice looking street that appeared empty. As we walked down it though it exploded with vendors hawking their food. There was one lady trying to sell us hot milk! The last thing we wanted! We were all sweaty! "Atatakai gyuunyuu, ikakadesu kaaaaaaa?" While pulling it out of where it was being kept warm and pointing to it with her hand like they do on the telly. We didn't have a heap of time so we thought we'd look in just one of the western houses. The Old Hakodate Public Hall. We had to wear slippers inside and they were really slippery on the shiny wooden floors! I was a bit worried we'd break our necks walking down the stairs. It was nice inside and there were explanations on what the rooms were used for in English. You could go out on the balcony and when we went up there there were some Japanese girls done up in make up and who had old fashioned western style dresses on. They were looking mournfully out to sea like they were waiting on some lover at war or something and having their photos taken. We looked at one of them though she broke her pose and gave an embarrassed smile. When we went back down stairs we saw you could hire the dresses and pay to get the make up done to you. Not really sure why they all wanted to look so sad though. While we were at the Old Public Hall someone came up and talked to us. I think he started talking to us in English but we continued in Japanese. He asked us where we were from and was excited that we were from Brisbane, Australia as he said he'd recently returned from visiting Melbourne! He asked us how long we'd been here/japan, how long we were staying, if we were going to see more of Hokkaido, what other places we were going to see in japan, if we were students and where I learnt japanese. When we finished talking to him Kate pointed out that he was actually wearing a I ♥ Brisbane cap at the time! I wish I had noticed it while we were talking! Since it was nearly sunset it was time to leave Motomachi and head to Mount Hakodate! We walked back along the narrow street and this time there was a man very unenthusiastically trying to sell us the hot milk again. When we got to the ropeway station we saw that there was a heap of taxis lined up outside but when we went in we found that it was completely deserted. The cable cars were not moving either! I was looking at a sign when someone (I think she was cleaning) came up and said that it was not operating. She took us outside though and pointed to a bus stop down the road a bit where there were a bunch of people lining up. She also said we could also get one of the taxis, but we decided on the bus. While walking to the bus stop I had a look on my phone at the rope way's website but I couldn't see anything about it being closed. It was only when I switched to the Japanese version that I saw the message! They were closed for two weeks for maintenance and we only just missed out. It looked like it was scheduled too so I would've found out earlier if I had looked at the website. Goes to show that you need to look at the Japanese website for updates on things like that! When we got to the bus stop we had a look at the timetable and found that we'd missed the bus by 5 minutes and the next one was over an hour away! Or so we would've thought if it wasn't for the big crowd of people standing around waiting. I asked someone when the bus was coming and he said "2-3 minutes". Turned out it was late! The first and only time we have had any of our transportation in Japan not come exactly on time. After another 5 minutes every one was on their phones ringing the bus company! In Australia we're so used to late buses so much that I've only seen people ring during cases where a bus that's supposed to come every 5 minutes doesn't come for an hour (and it was late at night). The bus showed up about a minute later and we hopped on. We started climbing the mountain straight away and for some reason there was a conductor lady on the bus who was narrating the whole trip. Along the way we could see the view from the bus already and it was looking pretty good! We also saw a couple walking up the road and I wondered if it was because of the ropeway/bus not coming. It was a long/steep way to walk and the girl did not look happy at all. Since we arrived just before dust we could enjoy the view both during the day and the night as well as get to see the sunset! The views from Mount Hakodate are considered one of Japan's three best night views and even during the day I could see why! The ocean was wide and blue and had a number of ships on and it was really cool how it surrounded Hakodate on either side of a narrow strip of land. The mountains in the background were good too. There was a building (attached to the rope way station) that we had a look inside of but it was really crowded and there was much inside apart from a restaurant and a souvenir shop. We really wanted hot chips for some reason but the restaurant was full and they didn't sell them anyway. We went back outside and since I neglected to bring a jumper I was freezing! We were setting up our camera for a timed photo when some people offered to take it for us! We've found that when people offer to take photos for you they rarely manage to get a good one and we've had much more success with finding a spot to put our camera. Once someone offers though we can't refuse as it'd look rude. After they take their not so good photo we can't then set up the camera again as it'd look like we didn't like their photo! Anyway we gave it to an older lady in the group and I heard a middle aged lady in the group say "Obaa-chan kara daijoubu ka na" (I wonder if it'll be ok since it's grandma). When she took the photo they all crowded around to see if she took one that was alright. It was actually quite a good one. I think we offered to take their photo as well. There's an old military fort nearby that we were considered visiting although since it was getting pretty dark and cold we decided not to visit. There wouldn't be much to do there in the dark. The building that we went into before had number of different outdoor levels and we were surprised going up as each time we thought we were at the top we found another level! While we were waiting for sunset we watched a young girl playing a Jyan ken pon (Scissors paper rock), with her mum. Whenever one of them won they'd go up the stairs and when they lost they'd go down the stairs. They kept playing for quite a while until the girl finally won! They both came close at times and it was a pretty intense game! Sunset was amazing and soon after Hakodate lit up with millions of lights! One thing that contributed to the whole experience was how close we were to the actual city. Many other mountain views of cities are actually a fair way from the city but we felt like we were just above it. It had also suddenly become incredibly crowded! The outside levels attached to the building had become completely full of people. It was completely packed. Thankfully the ground level had relatively few people and we enjoyed the view from there. The bus left pretty soon after sunset which was a bit disappointing as we wanted to wait the extra 20 minutes or so until it was completely dark. The next bus didn't come until around 100 minutes later though and since we certainly didn't want to wait that long we were stuck with the earlier bus. About 20 minutes before we thought the bus was scheduled to leave we went down to the stop to check the time. Luckily we did this as we found the bus was already there and about half full! The whole area apart from a narrow slot to let the public bus through was completely full of tour buses as well. We were worried about it getting completely full and there not being any room to get on so we kept coming back to check how it was going. Eventually at 10 minutes to go we ended up hopping on. There were no seats left so we had to stand. At around 5 minutes to go the bus was completely full although it waited until the scheduled time before departing. I'm really bad a standing as for some reason my feet get really sore after standing only for a little while. I have no idea why this happens but I can walk hours with no problems but as soon as I have to stand (or walk really slowly- like when shopping) my feet get really really sore. So I wasn't enjoying waiting very much. Remember how I said I was cold? Not anymore! Since there were so many people crammed onto the bus it got really really hot inside! And humid! The windows went completely foggy and were dripping moisture- it was like a sauna. One thing I found I was thankful for was that we were going down the mountain rather than up it as the other side of the road was a complete gridlock. I don't think there was any room left up the top so all the buses, cars and taxis were in a stationary line all the way down the mountain. I'm glad we came before dark. This situation was obviously caused by the non operation of the rope way. I thought that they should put more buses on to accommodate all the extra people but I'm not sure how any extra ones would get up the mountain. Maybe they could have them come earlier and wait up there? The conductor was squashed in with us and she narrated the journey back down as she did going up. The bus stopped along the side of the road so we could admire the view one last time as well. Once we got down from the mountain people started getting off and we managed to get a seat. It was such a relief to sit down and we found we could open the window and let some fresh air in. We stayed on the bus to Hakodate Station; it's final destination. The cheese cake we had during the day was so delicious that we went back to the Loisir Hotel and got another two cheese cakes! When we got them we were told we had to eat them today as the expiry date was tomorrow. We had no trouble doing that! For dinner we went to a nearby ramen shop. It wasn't anything too fancy, I got pork Ramen and as Kate had just had some sandwiches she didn't order anything. We ended up sharing a bit of the noodles and pork though. One thing that did happen was that even though we tried to pick somewhere without smoking someone lit up while we were there. Luckily they were at the other end of the restaurant but we could still smell it sadly. Avoiding cigarettes is a challenge in Japan as there's no law prohibiting consumption in restaurants and such. We both find the smell completely revolting for some reason, so it can be problematic finding a place that doesn't have the lingering smell even if no one is actually smoking at the time. The ramen was pretty good and after finishing it we returned back to our hotel and checked in. The only thing left to say is that since we were in a comfort we had the weird flat pillows again! Same solution though as last time except this time I wrote "二つ枕お願いします (2 Pillows please)" and Kate came back with a pillow each :-). Hey nice posts - reminds me nicely of when i visited hakodate. This blog also reminds me of my first travel blog - when i read it back after the hols it sounded all whingey and whiney coz i was also frequently commenting on stuff i didn't like. Thank you! I'm glad you enjoyed them! Do you think I'm focusing too much on the negatives? Mainly because there weren't any! I don't mind flat pillows at all although the rest are pretty bad. I'll try and be more positive if you like then! Hi! Thank you for the posting this. We will be going to Hokkaido this Thursday and for sure now know what to get when we're there! Keep on posting as I will come back and read your posts for our next trip to Japan! Wow that's pretty soon! I'm sure you'll have heaps of fun! Thank you again and have a great trip!